Brennan's Colony representatives (from left) Aran Keenan, Kathy Murphy and Richard Wise. Photo by Greg Bonanno. 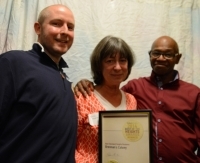 Following a summer marked by both tragedy and resilience, Brennan’s Colony received the title of Best Cleveland Heights Business in the 10th annual Best of the Heights Awards, held Sept. 23. Voters also honored the Lee Road restaurant and bar in naming it the Heights’s Best Bar, Pub or Tavern. “It’s an overwhelming testament to the amount of support the community has provided us, but most importantly it’s a testament to what Jim Brennan was able to do in his lifetime and in his years of service at the corner of Lee and Silsby, and I would be remiss to think that this award wasn’t directly for him,” said Aran Keenan, Brennan’s Colony manager. 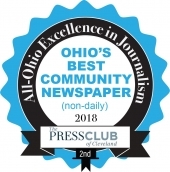 The Best of the Heights Awards is an annual recognition of outstanding Cleveland Heights and University Heights businesses. 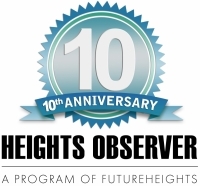 Each year, FutureHeights—a nonprofit dedicated to promoting civic engagement in the Heights through information, education, and advocacy, and the publisher of the Heights Observer community news—conducts the Best of the Heights survey to recognize the unique attributes of locally owned businesses here in the Heights, and their contributions to the local economy. From May through August, Heights residents voted for their favorite Heights businesses in 21 categories, and the winners were announced on Sept. 23. This year’s Best of the Heights Awards program provided a change from past ceremonies and featured more of a celebration and party-like atmosphere. Instead of a stage and acceptance speeches, finalists and guests enjoyed food, drinks, conversation and music, and the winners were announced with a flourish as banners were unfurled from a balcony. The Best University Heights Business award went to Whole Foods Market. Gigi’s on Fairmount took home the title of Best New Business, edging out fellow newcomers Four and Twenty Mercantile, Sweet Melissa and Yoga Roots. Quintana’s Barber and Dream Spa won the award for Best Customer Experience, and Theo Challouf bested shop-mate and Quintana’s owner Alex Quintana for the title of Best Barber. A new category this year, Best Enduring Business—which recognized longevity in the Heights business community—featured finalists Nighttown, Brennan’s Colony and Tommy’s Restaurant, which won the award. This year’s Best of the Heights Awards had even more of a special meaning, as it was the 10th annual presentation of a program in which FutureHeights finds great importance. “Recognizing and celebrating our local businesses through the Best of the Heights Awards is one way that FutureHeights acts to support and promote a vibrant local economy. These businesses are, for many of us, like home. 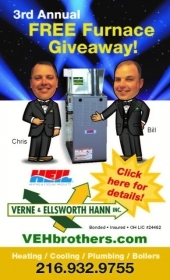 We know the proprietors and they know their customers. It's this connection to the community that we all value and that keeps us rooted here in the Heights,” said Clare Taft, president of the FutureHeights Board of Directors. Daniel Budin is a lifelong Cleveland Heights resident and member of the FutureHeights Board of Directors.